Mother’s Special Blend Skin Toning Oil is formulated to help prevent stretch marks naturally by nourishing and conditioning your skin while it expands and contracts – before, during and after pregnancy. Mother’s Special Blend is a safe formula for you and your baby. 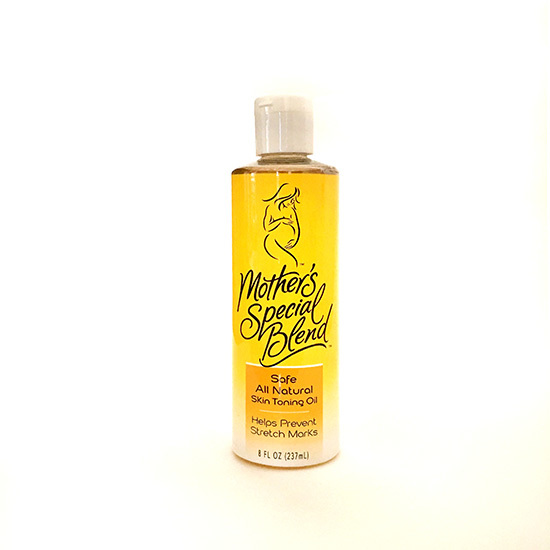 Mother’s Special Blend Skin Toning Oil is formulated to help prevent stretch marks naturally by nourishing and conditioning your skin while it expands and contracts – before, during and after pregnancy. Mother’s Special Blend is a safe formula for you and your baby. There are no chemicals, perfumes, emulsifiers, dyes, or preservatives. It is safe for all over body use. Please note: Color changes from clear to cloudy are normal due to extreme cold temperatures and easily remedied by placing the bottle with the cap sealed in hot water for 5-10 minutes. Ingredients: Almond oil, coconut oil, cocoa butter and vitamin E.